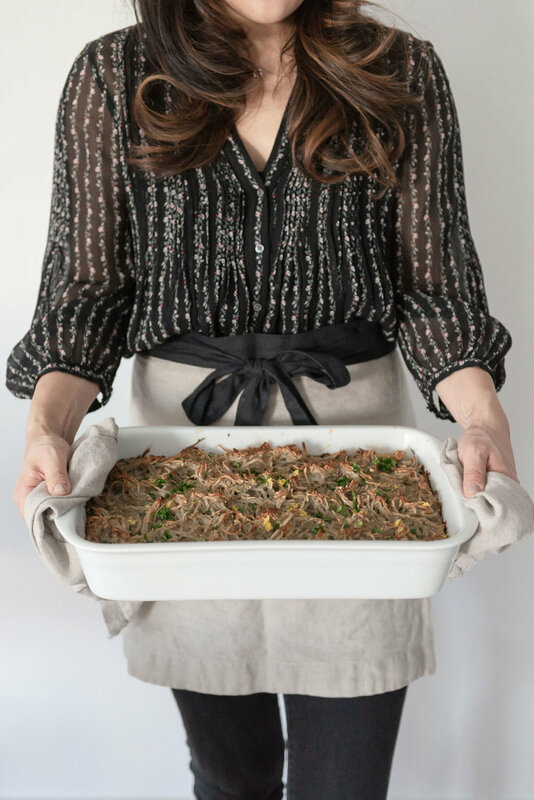 Savory Potato Kugel with Preserved Lemon for Passover — Nourish Co.
As evidenced in my challah breakfast strata recipe, I’m a savory person through and through. That’s why I was so excited to find recipes for savory potato kugel a few years back as I scrambled to think of something to bring to one of the first Passover Seders I was invited to. Dishes that are both hearty and filling while also being kosher for Passover can be hard to come by. This potato kugel is bright in flavor (and presentation) with the addition of preserved lemons mixed in, and topped with fresh herbs and lemon zest. Perhaps my favorite part is that it makes a great breakfast during the week of Passover. It’s delicious re-toasted and topped with a runny egg, to be eaten in rotation with matzo brei or perhaps matzo granola. Also, it can be frozen for months for an easy breakfast, whether it’s during Passover or not! Using a food processor with a regular blade, pulse the onions a few times until they are chopped into smaller pieces (but not totally ground). Place onions in a large mixing bowl. Switch out the blade to the grating blade. For the best presentation, lay the potatoes on their sides (the long way) and shred. Empty out the food processor a couple of times into a large mixing bowl. Place the baking dish in the oven with 1 tablespoon olive oil. Place the onion and potato mixture in a cheese cloth and squeeze liquid out. Sprinkle the onion and potato mixture with salt, pepper, and potato starch. Toss everything together with your hands. Add the eggs and preserved lemon and mix again with your hands. Remove the dish from the oven and distribute the oil evenly on the bottom of the dish, in the corners and on the sides. Pour the potato mixture into the pan slowly and be careful, since it will splatter a bit. Using your fingers, gently twist the potato shreds evenly to create a nice texture on the top of the dish. Brush with remaining tablespoon of oil. Bake for 60 minutes. Check on the kugel — if it’s browning unevenly turn the dish around to bake for another 15 minutes. At this point, check to see if the center is baked and the top is browned. Sprinkle with dill, chives, zest, and everything bagel seasoning. Cut into squares and serve. You can make it ahead and reheat it in the oven. It should keep in the fridge for a week and longer in the freezer. This kugel makes an excellent breakfast, topped with a poached or soft-cooked egg!